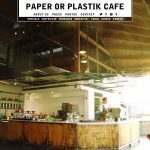 I was excited to get to work on the website for this wonderful community establishment. Each page has it’s own full page background image. Caryn had a very specific vision on her website and wanted a ton of features and widgets and doo-dads. She was very happy with the result. 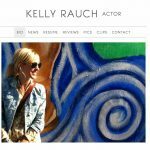 This is a simple and clean actor website design that doesn’t compromise on personality! 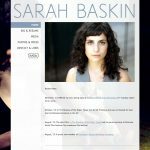 Sarah’s photography overall was very moody and indicative of her casting type, so I definitely used that when designing her actress website. Neli’s owners were going on a roadtrip for awhile so they had me create this cool logo/illustration of Neli and her ride. With that I made them a website so that they could blog about their adventures! 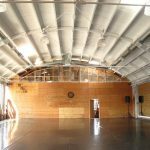 This dance studio website has a beautiful fullscreen background and some cool features like booking classes and a calendar. 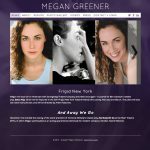 Check out this nice, moody purple website design for actress, Megan Greener. A slider is a great way to get multiple photos and looks on the homepage. 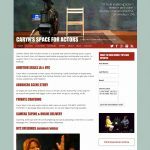 This actor website design focuses on some bold color choices that complement his aesthetic and main photography, helping to create a unified branding and experience. 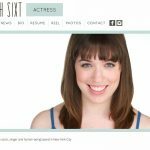 A simple and clean Actress website design that is easy to navigate but fun by showcasing her photos well.